​Participating households will receive a weekly box of the region’s best, freshly-harvested produce, PLUS whatever a la carte items you add to your shopping cart including meats, dairy, eggs, and value added products. Community Supported Agriculture programs started as a way for people to directly invest and participate in sustainable farming. The idea spawned from teachings of Rudolph Steiner and Biodynamic Agriculture as well as examples from Japan. In this model, shareholders share in the risks and rewards of farming, as opposed to the farmers bearing all the risk themselves. Shareholders pay upfront at the beginning of the season and then receive a weekly "share" coming off the farm. It is a much more organic and dynamic method of getting farm-fresh produce and helps the farmers by being flexible with timing, volume, and availability of certain crops. There is also a mutual understanding that sometimes acts of nature can entirely wipe out certain crops, and that when there is a surplus shareholders can take home some of the bounty for their own home canning and preserving. Typically, shareholders do not choose what items they get in their weekly box, and what they do get can include new and different vegetables or varieties that can help keep up creativity and fresh food consumption in the household. If you like to prepare and eat fresh, whole foods the CSA Fresh Box is for you!! As a natural foods chef and culinary instructor, I am fanatically discerning about the quality of my food. 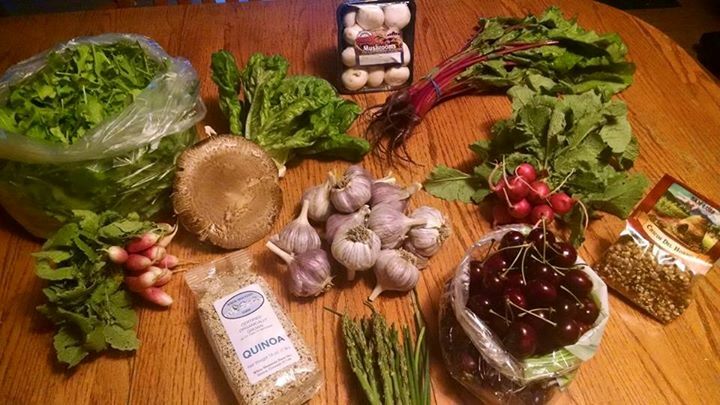 Having recently moved to the San Luis Valley from the San Francisco Bay Area, I couldn’t possibly imagine how the foods of this region could equal what I was accustomed to through the California CSAs and farmers markets.